I was born in Waco, Texas and was the 2nd child of 4. I have an older brother and two younger sisters. My older brother, Joe Jr., with whom I practiced law for 15 years, lives in Plano. I was raised in a small frame house, 3 bedrooms and 1 bathroom, located in South Waco. My Father was the first in his family to go to college. 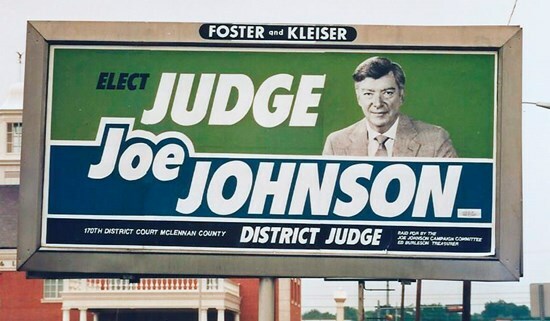 When I was in the 2nd grade, my Dad, who was a reporter for the Waco Paper covering the Court House, ran for Justice of the Peace at the suggestion of several Judges. My Dad was a non-lawyer and ran against a former county Judge who was a lawyer. This is my first memory of politics. My Dad and Mother worked day and night on his campaign. He had an uphill battle running against a known Waco attorney who had held political office. My Dad was elected in a 2 to 1 landslide in May of 1962 and was sworn in as Justice of the Peace in January of 1963. To comply with a campaign promise, my Dad enrolled in Baylor Law School in the summer of 1962. He went to law school and sat on the JP bench at the same time. I rarely saw him during those days as he studied day and night. He graduated from Baylor Law School and passed the bar in 1964 when I was in the 4th grade. I literally grew up in the courthouse. My Mother would often drop us off at the movie theater at noon, and we would walk to my Dad's chambers in the courthouse to get a ride home when he finished work. My Dad was a judge for 40 years. When I was in the 5th grade, my parents bought a lot and built a brick house across town in a better neighborhood. I started 6th grade at a new school. Things were getting better for my family. Our family adjusted well to the new schools and new part of town. I started Junior High in the Fall of 1968 and began playing the trumpet in the band. This was my passion, and I began playing professionally around town at the age of 17. I also began working summer and after school jobs. I graduated from Waco Richfield High School in 1974. My family did not have the money for us to go to college, so my choices were to go to a local junior college in Waco or go to Baylor. I chose Baylor and I paid 100% of my college tuition and expenses by working while going to school. I earned a BA in business in 1979. During my time at Baylor, I played in the Baylor Bands and jazz band. I also formed my own band that I owned, operated and promoted, playing dances, proms, fraternity/sorority parties and club dates all around Texas. After college, I worked for 7 years in two competitive businesses and was successful at both. I decided to go to law school and was a student at Oklahoma City University (OCU) School of Law. During my 2nd year of law school I began working full time at the Law Firm of Mills, Whitten, Mills, Mills & Hinkle. I finished law school early by going straight through (including summers) and working full time at the Mills law Firm. I started in August of 1986 and graduated in December of 1988. I tried my first jury trial as a law student in Oklahoma County with my supervising lawyer helping me during the trial. From January 1989 to August 1989 I worked at Haley Davis Wren Bristow & Rasner in Waco, Texas. My practice involved Medical Malpractice Defense and Defense of the City of Waco and McLennan County. In February 1989 I took and passed the Texas Bar Exam. I was sworn in May of 1989 to practice in all Texas State Courts. I am also licensed to practice in Federal Courts of the Northern and Eastern Districts of Texas. In August of 1989 I moved to Dallas and joined Ford Needham Johnson & Lovelace. I immediately began trying jury trials, and tried my first case in September of 1989. I became Board Certified in Personal Injury Trial Law in 1994, which was the earliest date I was eligible to take the test. I have been re-certified every 5 years since that time to the present. I was and still am AV rated Preeminent with Martindale Hubbard. I was chosen as a Super Lawyer by Texas Monthly Magazine in 2008. I have been a member of both the Texas Trial Lawyers Association and the Association of Trial lawyers of America. I was also a member of the Dallas Bar Association where I chaired the Referral Service Committee. During this time I tried in excess of 45 jury trials in State and Federal Courts. Since 2008 I have worked as a solo practitioner handling Family Law, Commercial cases and Personal Injury, restricting my practice in March of 2013 to mass tort cases representing injured and deceased victims of dangerous drugs and medical/ surgical devices. I have been and still am involved in these product liability cases in several different areas of the United States.